Blastocystis Parasite Blog: Dying to know about Dientamoeba? It's difficult to say 'Blastocystis' without saying 'Dientamoeba fragilis'. Both parasites tend to be extremely common in countries where other intestinal parasites (e.g. Entamoeba, Giardia, Cryptosporidium) are of low endemic occurrence, and they are often seen together in patient samples. It is only due to the recent introduction of DNA-based diagnostic methods (PCR) that we now know that these parasites are much more common than previously anticipated. So, while I'm trying to encourage guest bloggers, I thought I'd introduce a 'guest star' - Dientamoeba! Dientamoeba fragilis trophozoites with the characteristic binucleated feature. The parasite belongs to the trichomonads, which also comprise parasites such as Histomonas meleagridis (the cause of 'blackhead disease' in turkeys) and - more distantly - Trichomonas vaginalis. At our Parasitology Lab at Statens Serum Institut in Copenhagen we have been using real-time PCR for specific detection of Dientamoeba fragilis in faecal samples from patients with gastrointestinal symptoms for quite a few years now. In the period of 2008-2011 we analysed 22,484 stool samples for D. fragilis. The overall prevalence of the parasite in these samples was 43% but depended mainly on age (Figure 1). 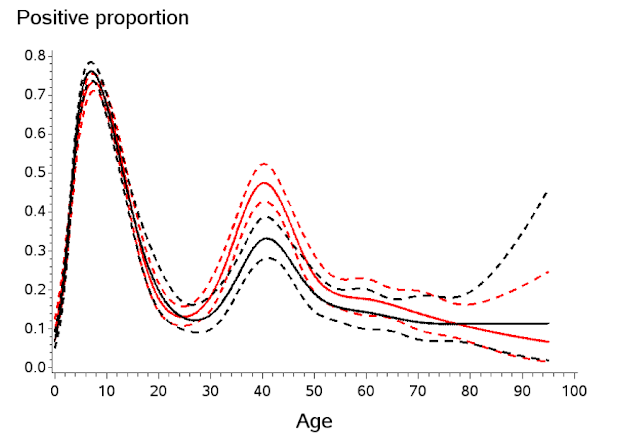 D. fragilis prevalence appears to fluctuate dramatically depending on the age group. Highest prevalence was seen among 7-year-olds, and a second 'peak' is seen in the parental age suggesting that infected children pass on infections to their parents. Figure 1: Prevalence of D. fragilis as a function of age. (For more information, see Röser et al., 2013b). Intestinal protozoa are transmitted faecal-orally and most of them have a cyst stage. However, a few protozoa appear not to have a cyst stage, among them D. fragilis. There is a lot of evidence that Histomonas meleagridis is transmitted by eggs of Heterakis gallinae, a nematode of galliform birds. Conspicuously, we recently demonstrated the presence of D. fragilis DNA in surface-sterilised eggs of Enterobius vermicularis (pinworm). The implications of this finding are unclear but could suggest a similar vector-borne transmission of D. fragilis. As in so many other situations it is not possible to dish out simple guidelines as to when to test for and treat D. fragilis. It is clear that many carriers experience few or no symptoms at all, but there are several case reports demonstrating symptom relief in patients eradicated of D. fragilis. We published one such case recently in 'Ugeskrift for Læger' - the journal of the Danish Medical Association. Basically, the report describes lasting symptom relief after documented eradication of D. fragilis using high dose metronidazole. However, the patient's symptoms returned after a year, and real-time PCR revealed D. fragilis positive stools. Eradication was achieved using paromomycin (250 mg x 3 for nine days). Contrary to Blastocystis, this parasite exhibits remarkably limited genetic diversity. We recently analysed three different genetic loci (18S, actin, elongation factor 1-alpha), and we confirmed that only 2 genotypes exist, one of which is very rare. Genetically, however, the two genotypes are quite different, and it will be interesting to compare the nuclear genomes of the two, once they have become available. Dientamoeba has been speculated to be a neglected cause/differential diagnosis of irritable bowel syndrome (IBS). We once found a statistical significant association between IBS and Dientamoeba; however, other more recent and more targeted studies (one of which is ongoing) have not confirmed this association. However, multiple factors could interact and analysing only simple associations such as symptoms related to parasite presence/absence may be a limiting approach; for instance, infection load/intensity may play a role, and other factors such as host genetics/susceptibility and microbiota ecology may be significant factors influencing on clinical outcome as well. On that note, we have observed some very low Ct values in our real-time PCR results for some of our D. fragilis positive patients, suggesting massive infections. D. fragilis infections are probably often long lasting (months), and if symptoms appear in the initial phase of infection only, cross-sectional studies of prevalence and clinical presentation will be potentially misleading. Large longitudinal cohort studies of pre-school children with monitoring of incidence of pinworm and D. fragilis infections would be extremely informative. Dr Dennis Röser here at the SSI is currently finishing a randomised controlled treatment trial of D. fragilis in children, testing the clinical efficacy of metronidazole treatment versus placebo. Results are expected next year, so watch out for a 'D. fragilis special' by Dr Röser in 2014! It appears a lot easier to eradicate D. fragilis than Blastocystis - at least on a short term basis with metronidazole having an efficacy of about 70% or so (unconfirmed). A couple of reviews free for download are available; please see literature list below or go here and here.